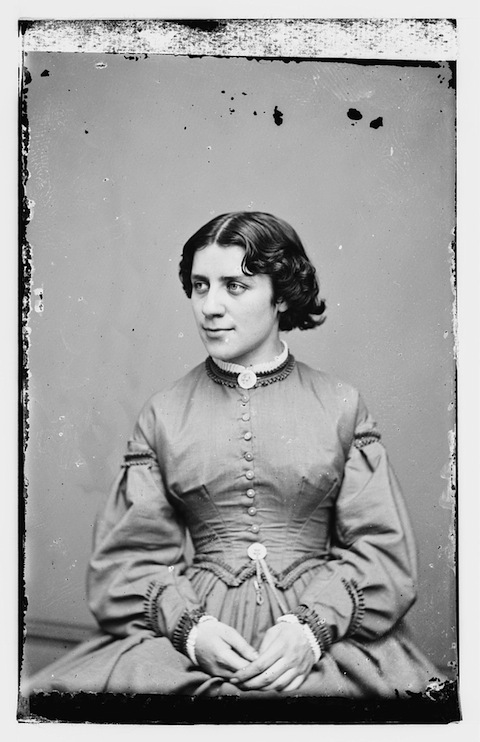 On March 24, 1863, Anna Elizabeth Dickinson, a 20-year-old Quaker and abolitionist from Pennsylvania, spoke at Hartford’s Touro Hall. Dickinson had been paid by Connecticut Republicans to deliver a speech in support of the reelection campaign of wartime governor William A. Buckingham. As a woman, Dickinson did not have the right to vote, yet she was allowed to use her voice to promote support for the Civil War and the end of slavery. Dickinson’s public appearances in Connecticut helped support her family and made her famous. Her followers formed what would be known as the Loyal Women’s League, a pro-war movement made up entirely of women. It was thought by many that Dickinson’s fiery speeches revitalized the Republican party in Connecticut. For her final speaking engagement, she received $400 in cash, a pocket watch on a chain, and a Colt revolver. Gallman, J. Matthew. America’s Joan of Arc: The Life of Anna Elizabeth Dickinson. New York, NY: Oxford University Press, 2006.